These days Milan couldn’t boast the nice weather, so the statement umbrella became the key women’s accessory at the Milan Fashion Week Fall 2013. The fashion-forward ladies from all over the world as well as the A-list celebrities couldn’t stop demonstrating us the dramatic outfits that featured plaid, purples as well as an elegant white. As for the accessories, they deserve the special attention: for instance, Miroslava Duma’s headscarf with paisley prints, which she used to protect her face from the snow, really stood out as well as the original Minnie Mouse baseball cap. The rain also encouraged some fashion innovations such as replacing the umbrellas with the clutches. Besides, the hoods worn over the face brought the mysterious feel to the looks. Miroslava Duma combined the blacks and plaid for the tailored look, which she intensified with the eyewear. 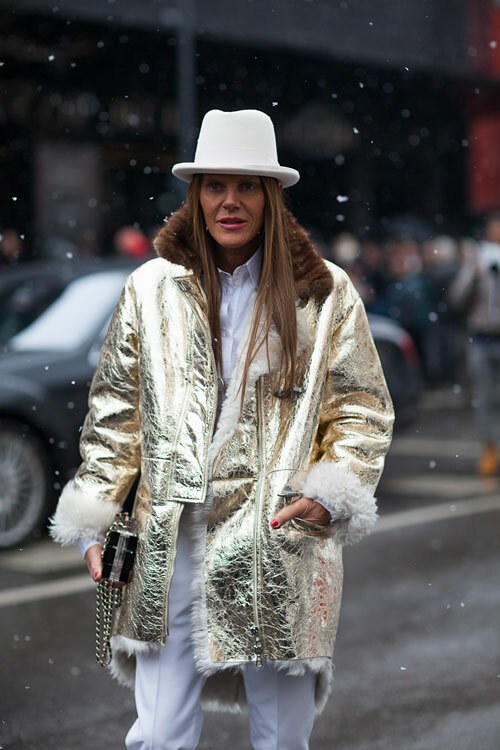 Anna Dello Russo knows how to create a furore: this time it was a Marc Jacobs fur hat that made her look. Though those were not the best weather conditions for wearing the totally white outfit, some girls still dared to wear the ensemble in this traditionally summer hue. This lady demonstrates the excellent skills in combining distinct patterns and colors. This outfit perfectly demonstrates that distinct shades of the same color could work out well, especially when complemented with contrasting black and yellow. Seems like white became one of the key colors during this Milan Fashion Week Fall 2013. In this particular case the white jumpsuit was complemented with yellow sunglasses, which added the playful feel to the look. 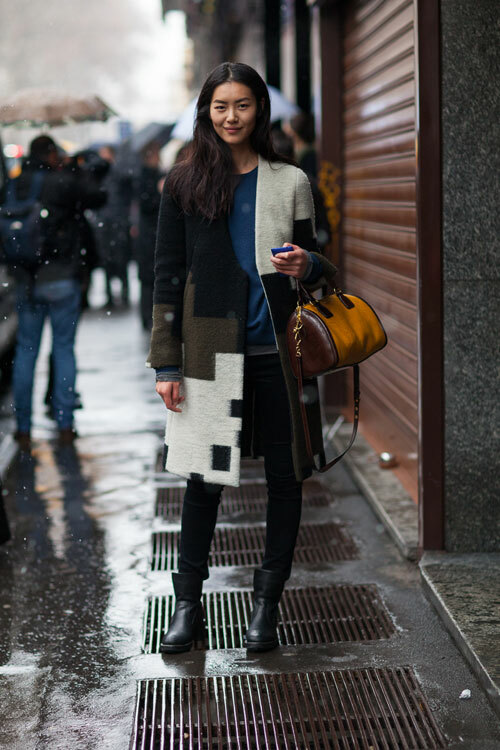 Liu Wen added an edgy twist to her simple look with the color-blocked coat. 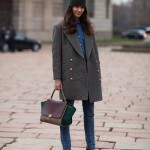 This look perfectly demonstrates that the statement coat could vivify even the simplest outfit. Want to incorporate the sporty feel to the look? 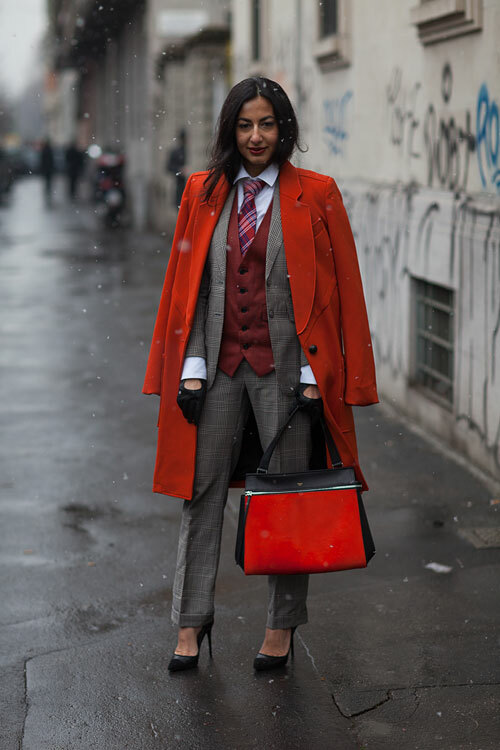 Simply wear the varsity jacket under the tailored trench coat like this lady did. Leopard print still remains the hottest trend of the season as well as fur. So, no wonder the hottest trends came together in this stylish ensemble. This look evokes the clear associations with the imperial Russia owing to the coat with beautiful gold pattern, headscarf in red and gold and the fur hat. Anna Dello Russo looked classy in the tailored Burberry trench coat, which she accessorized with dark specs and fur boa. This ensemble is constructed in the warm pastel hues, except for the midnight blue Birkin handbag. Though one might consider this look to be overloaded with details and patterns, it still looks hot and bold. Ulyana Sergeenko stays true to her signature style as she stunned in the ankle-length coat accessorized with the bright red clutch in the form of the rose. This military style-inspired coat by Isabel Marant looks especially hot when worn by the fragile girl. Olivia Palermo looks chic and stylish as she opted for the Dolce & Gabbana coat, patent stilettos and grey and blue shoulder bag. Anna Dello Russo wouldn’t be Anna Dello Russo without her love to epatage. This time she decided to demonstrate the hip hop mood.